Some shared photographs are already in galleries or albums where no password is required. However, a few folders in the BFA folder require a password, which is: CND_BunkY! If you wish to see all other photos intended for general viewing, you can go to: https://douglasdetling.smugmug.com. No BFA funds are used to maintain this photo site; Doug has made this storage space available as a general contribution to our family association. Please note this site is now implementing more rigorous security settings through a Secure Sockets Layer certificate. The correct way to access the site is by entering https://www.bunkerfamilyassn.org in your browser. If you use the old http: entry, you will be re-directed to the proper, and secure site. not miss the May 1 deadline. “I think this was storm damage. I don’t see evidence of vandalism. 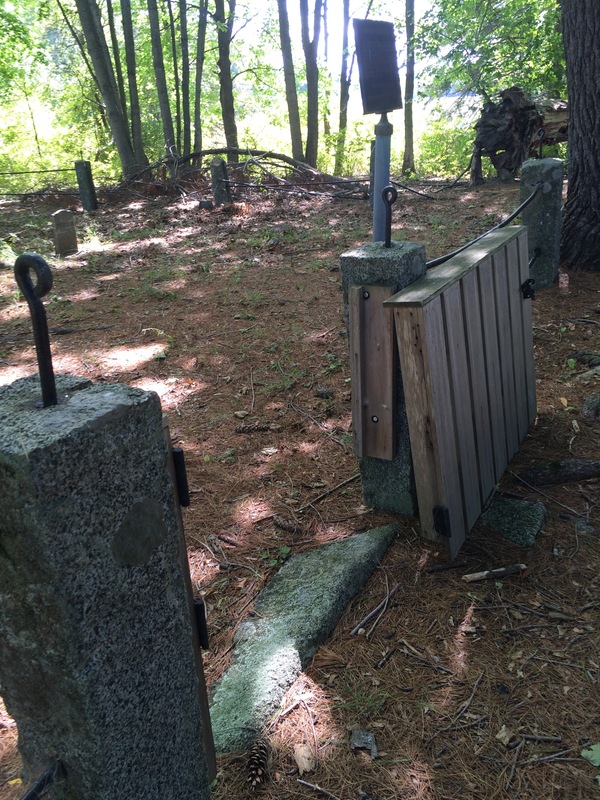 In fact, someone was kind enough to prop the gate up against the granite post. “I think it’s possible that in one case a very large limb came down and broke the fence. That’s why I took a picture of the limb lying on the side. 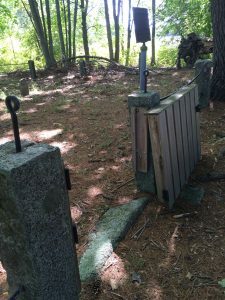 At the other end of the graveyard, the fencing is pulling out because the granite post in the corner continue to lean more and more as the ground shifts. You can also see this in the picture of that section. Although in the future visitors may not be required to enter a password or register, for the time being visitors will need this password to enter the BFA’s photo gallery: CND_BunkY! Natalie will attend Colorado State University in Fort Collins, CO and plans to study neuroscience with the goal of providing care in support and relief from debilitating neural disorders. She attended Lakewood High School, Lakewood, CO where she was a Girl Scout, tutor and participated in seven years of science fairs. Previous honors include a Colorado Merit Scholarship, President’s Academic Award and Academic High Honors from Lakewood High as well as several awards in Girl Scouts. Good luck to Natalie! We know your grandmother JoAnn Stearns Snyder (past BFA Treasurer), is proud of you, as are we! Brian Anthony Bunker was born in Wandsworth, London, England, on 5 April 1936, the only child of Albert R. G. Bunker and Harriett Brooks. He passed away 21 June 2015. From 1960 to 1995, Brian taught history and English at Carshalton Boys School, Surrey, England. Brian adamantly opposed all wars and sending mere boys off to be slaughtered or returned forever scarred by their experience. He frequently expressed his views on this matter. He cherished the boys he had taught for so many years but he had delightful comments about some of their antics. Brian had a droll sense of humor and it was a delight to work with him. His comments about British politicians spiced up many conversations and he will be so missed by all of us. Brian never married and left no children. The Annabelle Moore Scholarship Award is a $500 grant given to a child or grandchild of a Bunker Family Association member in good standing. The recipient will be a high school graduating senior or college freshman. The scholarship is awarded on the following basis: (1) Scholarship attainment, (2) Goals and worthiness, (3) Financial need, (4) Activities and awards. The 169th edition of the Bunker Family Association’s regular newsletter is at the printers for postal delivery, and members who have opted for electronic delivery have been sent the PDF version directly or via shared links. The lead story this month is quite interesting–a dispatch of handwritten letters from Matthew Bunker (a Nantucket Bunker) to his parents in Brooklyn, New York in 1853. Matthew sent the letters from Australia, where he was traveling to the gold fields and forming the Bunker Freeland & Co. partnership for selling goods to the miners. And another interesting tidbit: the future replacement of the Charlestown (High) Bridge across the Charles River in Boston. BFA President Gil Bunker notes that, except by Charlestown residents who call it the Charlestown and/or High Bridge, the bridge is commonly known as the Zakim Bridge after civil rights activist Leonard P. Zakim, though when the current structure was built in the 1950s it was to be known as the Bunker Hill Memorial Bridge (its two suspension tower peaks replicate the Bunker Hill Monument. Also Gil comments about the restoration of the BFA’s tax exempt status, and Mary Bunker Peterson sent in photos of the Bunker Garrison graveyard restoration work performed in September. Also, please note that, unless you have paid your BFA dues recently, the November Banner may be the last paper copy you receive, as the membership list will be reviewed and those substantially in arrears are subject to being dropped from the membership rolls. Dues may be paid to the BFA and mailed to Treasurer Lowell Bunker (see membership or contacts pages for mailing address). Thanks to the diligent efforts of BFA President Gil Bunker, the Internal Revenue Service has reinstated the tax-exempt status of the Bunker Family Association. The reinstatement is retroactive to November 15, 2011, when tax-exempt status lapsed. Various documents have been refiled, and the BFA continues to qualify for tax-exempt contributions. This is an annual report on the Bunker Family Association’s web site and e-mail activities. Prior family commitments and my business commitments prevent attendance at this year’s reunion. Our e-mail group at Rootsweb.com remains active with more than 160 subscribers—about the same as last year’s total. Not all of these are members of the BFA. Anyone wishing to subscribe to the list may send an e-mail request to BUNKER-L-request@rootsweb.com with the word “subscribe” in the subject line. Alternatively, some folks prefer to allow the list manager (that’s me) to manually subscribe them. You can send me at an e-mail request at doug.detling@gmail.com and I’ll add you. This past year has been a particular challenge, as many long-time subscribers have been removed due to spam filters (interpreting our list messages as spam) at many large e-mail providers such as Microsoft, Yahoo and Comcast, forcing a lot of many re-subscription work. I believe this will continue to be a problem, and I am exploring some alternatives for Association members but this has the downside of limiting outreach to those interested in genealogy (Rootsweb is the largest provider of e-mail groups for those doing surname genealogy research). The BFA web site at https://www.bunkerfamilyassn.org is hosted at a large commercial hosting company. The annual cost of maintaining the site has been $110, including the domain name registry and no web data traffic charges, though costs may go up later this year due to a possible switch in providers. The current provider (1and1.com) is not particularly responsive to long-time customers (such as the BFA) and during the last year we have had several outages for hours at a time on the web site. I am exploring alternatives but we may not be able to maintain the current budget level (which has been stable for several years). I don’t expect the cost to be more than $125, however. Electronic distribution of the Bunker Banner (begun last year) has grown slightly but has not yet reached the level that BFA mailing expenses are significantly reduced. Part of the reason, I think, is that we haven’t hit on the perfect method of making these files available (large attachments are blocked by some e-mail mail providers so we are using shared document links). I will be happy to work with any member who wants to get files electronically via e-mail distribution or shared links. Photographs of interest to BFA members continue to be accessible through the webmaster’s photo site at http://greencity.phanfare.com. I pay an annual fee for this site, but sharing a few photo albums with BFA members can be just considered a contribution to behalf of the BFA (in other words, no BFA funds are involved in this) and I will happily post photos from the reunion there. Another activity of the web master is the production of the CDs and USB thumb drives that Bette Bunker Richards has created on the Bedford and Devon Bunker families. When current CD versions are sold, we will only be distributing these files on USB thumb drives. While USB drives are more expensive, production time is significantly shorter per copy (about 2 minutes per thumb drive compared to 20-30 minutes per CD), and the master files are easier to update as Adobe alters PDF reader requirements. Also, many newer computers don’t have CD readers. I continue to work on scanning back issues of the Bunker Banner for distribution on thumb drives and expect to complete that by fall (more than half-way there). This work has been more time consuming that I expected, also limiting me from progressing on a new version that extends and corrects some of the work on the Devon Bunkers CD on my own line (descendants of Sobriety Bunker).